More and more people are becoming online retailers in one way or another. From selling unused household items online to hand-made crafts to having a full-fledged online store, selling products to a global audience is easier than ever before via the Internet and worldwide web. Unfortunately, this trend has also led to more bad product photography than ever before. If you or someone you know plans to sell products online or off, there are some key things to keep in mind to get the best results. Having high quality product photography shots is crucial in connecting with ideal buyers and making maximum sales. The following are some tips for choosing the ideal color backdrops and showcasing products in the best possible light. The cardinal rule of effective product photography and backdrop color selection is ensuring that the product takes front and center stage. For this reason, neutral colors are almost always a safe bet. Warm or cool grays can be ideal for many product types. Tan, cream, ivory and neutral versions of just about any color on the color wheel can work as well. Black and white photography backdrops for products also help to create a sleek, professional result that showcases the product in an ideal manner. A product photography backdrop may be as close as the nearest uncluttered wall in your home or business. Any wall that is painted in a light or neutral tone can be ideal for product photography. Beyond this convenient option, one of the top product photography backdrop materials is seamless paper. Seamless paper comes in just about any color you can imagine including a range of attractive neutrals. Having a roll of gray, black and white on hand can be the starting point of any product photography collection. From there, a range of colors are available with which to experiment. Seamless paper comes in completely solid tones as well as gradations of color that can create a compelling and appealing look. The paper is affordable and disposable, so if a section gets scuffed, ripped or damaged, it can be torn off and thrown away. A new, fresh section can then be unrolled and used for photography in its place. Other materials used in product photography are muslin and canvas. Both are forms of cloth, with muslin providing an affordable seamless fabric option for an artistic look in product photography. Muslin can be used steamed and pulled flat to emulate the look of seamless paper. However, it can also be artistically left wrinkled and/or draped to create a specific crushed fabric look or more casual atmosphere. If models will be used with the products, muslin can provide a beautiful setting. 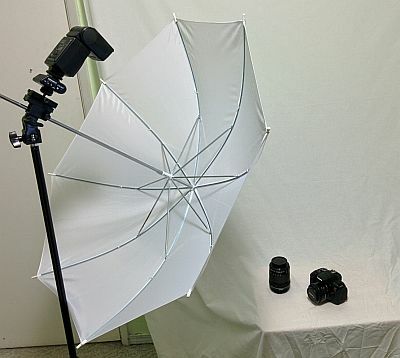 Another cloth option for product photography backdrops is artist’s canvas. This canvas is wide, seamless and stretched and primed like a painting before it is created. Because of all the extra labor, it tends to be the most expensive product photography backdrop option. However, a range of high quality effects are possible, as this type of backdrop can be painted in any way you can imagine. Results are limited only to the artist’s imagination and skill level. Muslin and canvas are available in white, black and gray but can look particularly compelling when painted in modeled colors. 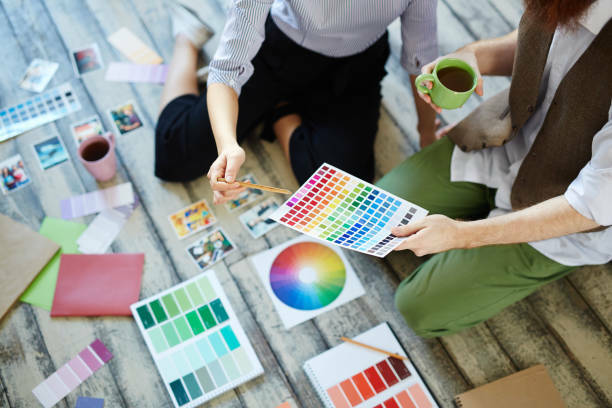 Blends of brown or blue tones with subtle flecks of green, orange and pink can be attractive when product models will be in the shot. Both looks help to accent human skin tones while still staying in the background so that your subject (the product) can steal the show. While basic, neutral colors are a safe choice for product photography, a world of possibility awaits. Consider trying bold, unexpected and contrasting backdrop colors to see what happens. Digital photography is easy and affordable, and it can be a comfort knowing you can always delete the shots that don’t work.